Our luxury vinyl tiles are available in a large range of different designs and effects. Luxury vinyl tiles are perfect for you if you are looking for hassle-free, luxurious looking floors. In fact, they are ideal for any room in your home, or business, as they can be installed over existing ceramic tiles, laminate, concrete or wood flooring. They are 100% water resistant, easily cleaned and very durable. Luxury vinyl tiles are made to look like real wood or stone flooring but they provide many more practical benefits. They are available in various plank sizes and tile effects so you can create an authentic looking floor in your home. Plus they offer you flexibility as they can be easily laid, easily replaced (in case of damage) and even taken with you if you move. Also referred to as LVT flooring or designer floor tiles they are highly practical yet beautiful too. At Floormaster we offer both the fixed systems and the new ‘click’ system vinyl tiles for easy installation. In fact, luxury vinyl tile click is becoming one of our top selling floor coverings. 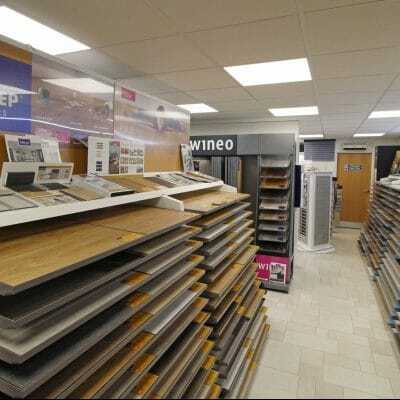 In fact, we have one of the largest selections of LVT flooring in Barnsley. Come and take a look at our showroom in Barnsley or let us come to you with our mobile showroom. We offer a complete installation service, from floor preparation to finish. We can uplift and dispose of existing floor coverings, trim doors and move and replace furniture as part of our unique installation service.